The network MIPS-platform has two Ethernet channels, possesses the advanced periphery (USB, UART, I2S, AC’97, SD/MMC, IrDA) and is intended for use in the communication equipment. The presence of buffered 32-digit bus provides connection to the board of any user devices. Range of application is single-board computers with a simultaneous output in an external and internal network, gateway screens and routers. · two LED indicators of modes. · hardware support of video, network and system interfaces by peripherals controllers integrated in CPU. o graphic QT3 libraries for a usual mode and with multithreading support, including language support by means of UNICODE. The processor module is executed on 8-layer MPCB with the dimensions 80mm x 76mm. It has two 100-pins communication slots: integrated peripherals and user. All signals of internal peripherals controllers are outputed from the processor on the first (peripheral) slot. The buffered static bus with additional group of control signals of an external video controller (S1D13505, Epson; MB8629x, Fujitsu) with support of the resolution up to 1600x1200 points is outputed on the second (user) slot. 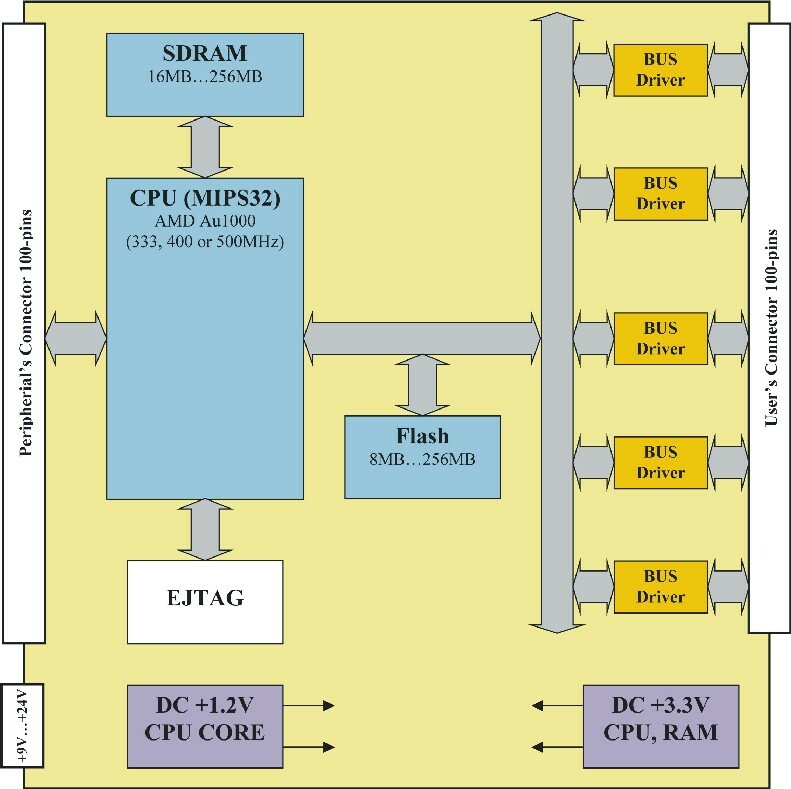 Management of bus-based shapers is carried out by activation of a hardware flag of the processor which should be executed before the reference to external devices. On the termination of an exchange session the flag is programmatically switched in a passive mode and the bus drivers jump in floating state. The special opportunity of compulsory switch of the bus drivers in Z-flate is provided on the part of external devices that allows to organize with the minimal delay emergency information interchange between its abonents passing by the central processor. · FCPU – 333MHz, 400MHz or 500MHz. · +12V - supply of LCD panel backlights inverter. · +3.3V - voltage of CPU, Flash, SDRAM supply (for independent work of the module). If necessary own DC-DC converters of the processor module can be switched - off, and supply is sent through the user slot from the interface module. To provide functions of supply division of digital/analog parts of devices there is an add-in separate slot of a network connection +9V … +24V on the processor module. Power consumption of the processor module depending on CPU speed and SDRAM makes from 1,3 W up to 2,8 W.
Cost of the componentry of an individual unit does not exceed a mark 105 $ in the minimal configuration – CPU 330MHz, Flash 8MB, SDRAM 16MB. At the use of external power supplies +1.2V и +3.3V he price of componentry can be reduced up to 85$.